The Blue Line on Washington Boulevard. Photo by Steve Hymon/Metro. Three Metro Blue Line stations — Grand/LATTC, San Pedro Street and Washington — will be closed, and there will be no Blue Line trains between 7th Street/Metro Center and Vernon Station, beginning this Friday, January 22 at 9 p.m. through Sunday, January 24. Closure of the tracks will allow crews to perform weatherizing work on the Blue Line along Washington Boulevard, in order to ensure safe, on-time and reliable service during El Niño storms. Supplemental service during the closure will include a combination of Expo Line trains and Express and Local bus shuttles. Blue Line customers traveling between downtown L.A. and Vernon Station should use the Expo Line for service between 7th Street/Metro Center and 23rd Street/LATTC/Ortho Institute, and Metro bus shuttles between 23rd Street/LATTC/Ortho Institute and Vernon. 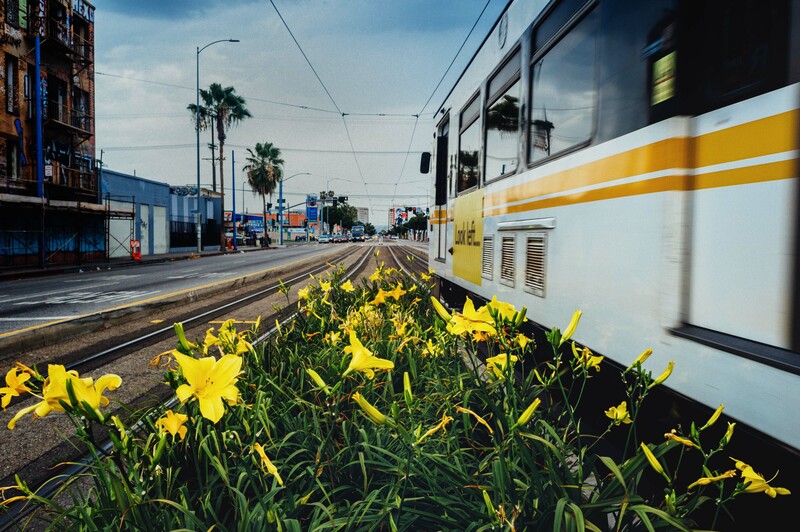 Expo Line trains will follow the regular schedule between 7th Street/Metro Center and Culver City throughout the weekend. 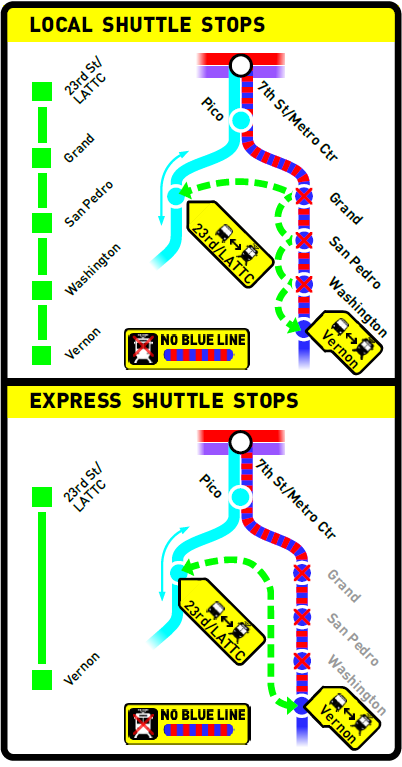 Local bus shuttles will make stops at Grand/LATTC, San Pedro Street and Washington stations. Express buses will provide non-stop service between 23rd Street/LATTC/Ortho Institute and Vernon. Both express and local bus shuttles are planned to match Blue Line service levels as closely as possible throughout the weekend. Metro customers transferring between Blue Line trains, bus shuttles and the Expo Line should be sure to allow extra time to reach their destination. Some customers may also be able to use the Metro Green and Silver Line as an alternate route between downtown L.A. and South L.A.
Friday, Jan. 22 after 9 p.m.: Every 10 minutes through approximately 12:30 a.m., then every 20 minutes until close. The last, complete northbound trips from Long Beach to downtown L.A will depart Downtown Long Beach Station at approximately: 7:23, 7:42 and 8:02 p.m. The last, complete southbound trips from downtown L.A. to Long Beach will depart 7th Street/Metro Center at approximately: 8:25, 8:35 and 8:45 p.m.
Saturday and Sunday, Jan. 23 and 24: Every 12 minutes throughout the day. Normal Blue Line rail service to all stations will resume at start of business Monday, January 25. The Metro Mobile app and Nextrip mobile site are programed to accurately reflect Blue Line train arrival times throughout the weekend, and customers can follow @Metrolosangeles or @MetroLAalerts on Twitter for the latest service updates. How We Roll, Jan. 21-22: why do drivers support transit? At least this time, there’s an express bus-bridge. Will i still be able to use it at 5:00PM later? because it says closure starts at9PM tonight. please confirm. Yes, the bus shuttles will continue to run as long as rail is in service, which is until 2 a.m. Friday and Saturday nights. The express made all the difference in the world. It made the bus-bridge almost pleasant.